If you hadn’t heard, we recently went to Nashville to celebrate our birthday. Mary scoped out some restaurants for us to enjoy, one of them being Avo. The food served at Avo is completely raw and vegan which also means most of the options are naturally gluten free. Our party consisted of multiple dietary preferences which the menu easily catered too. The food was off-the-charts good! We were obviously inspired by the foods we tasted at Avo and are hoping to incorporate raw vegan food into our daily diets. Here is a simple dish that is quick and easy to create, is super delicious, and is perfect for someone who is just starting to try raw cooking, like us! 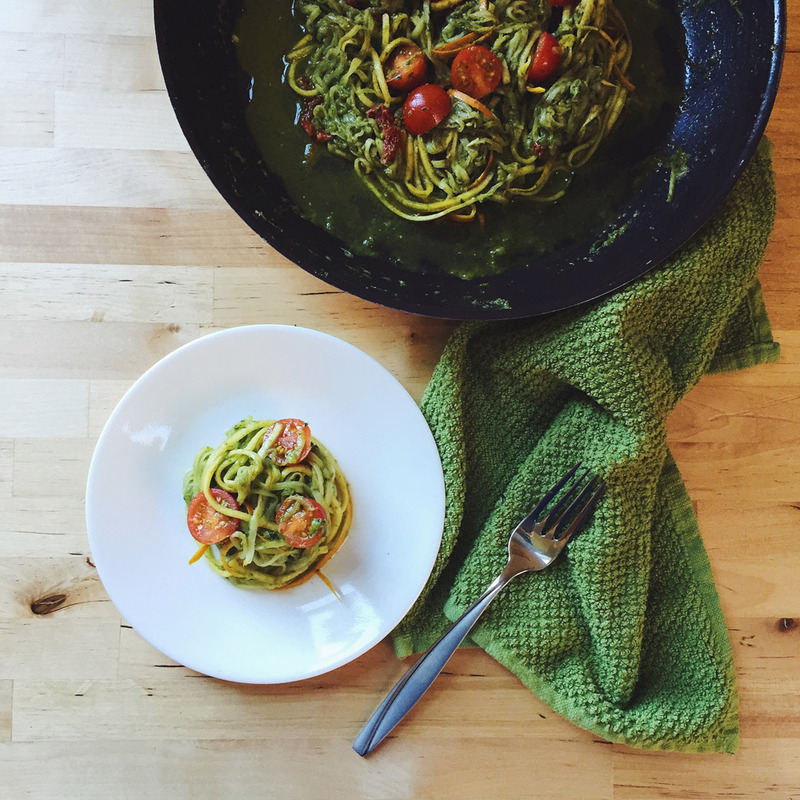 Let us know what you think of the zoodles (zucchini noodles). We think they are the perfect replacement for pasta which makes them perfect for a light lunch on a hot summer day. There are many ways to create zoodles. Some food processors have a spiral slice option. 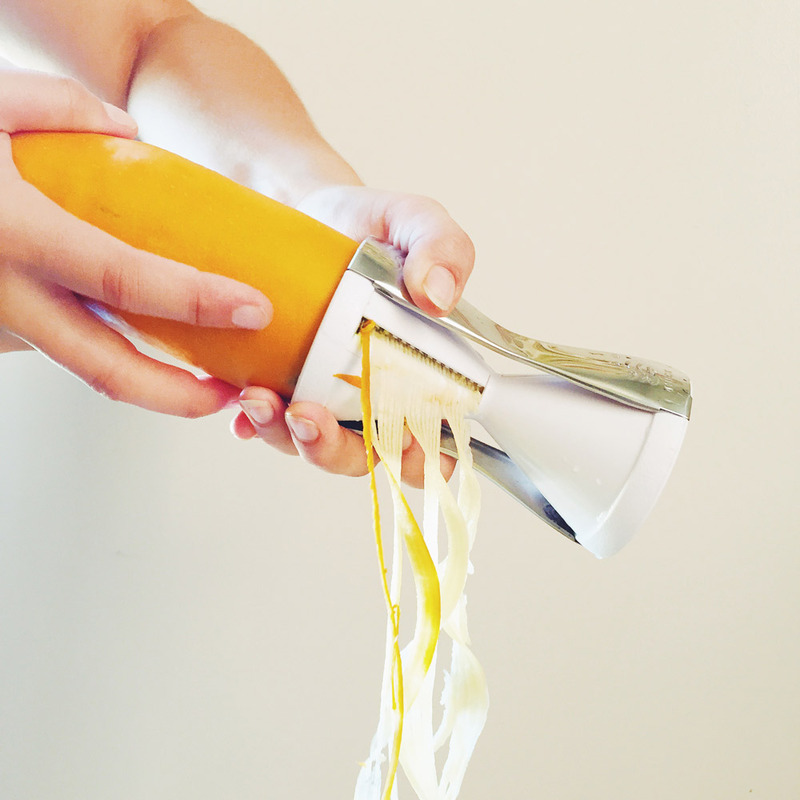 If you have limited counter space like we do, try a hand-held spiral slicer, seen above. There are plenty of options that will create perfect zoodles and easily fit in a drawer. Toss the ingredients in a large mixing bowl and add salt and pepper to taste. Serve immediately and enjoy often. Be sure to create your own pesto for this dish to ensure it is vegan and good quality. We like making a big batch and keeping it in the fridge for quick spreads, or salad dressing. Combine all ingredients in a blender and blend until a thick paste forms. Slowly add in any additional olive oil until the desired consistency is reached. Salt and pepper to taste. This pesto is best served immediately but will keep in an airtight container for up to a week.